French restaurants in Madrid "avec une touche élégante"
French restaurants in Madrid “avec une touche élégante”. The foodie trends do not stop changing, and within the gastronomic world of the city, French restaurants in Madrid are in fashion. The cuisine of France is one of the largest forgotten in Spain (except for the “cordon bleu”) but that’s changing. The classic Gallic restaurants of the city are being updated and the news is traveling very fast. Find out everything! Jardín de Invierno de Antoinette. Foto de Antoinette. Just opened and has already made a hole in the heart of many foodies in Madrid. It’s a brasserie, that is, a place where informal food is served throughout the day, but in a chic and refined atmosphere. Its ingredients come directly from France, as do its owners. They have managed to make their recipes very faithful to the original ones, both the dishes on the menu and their waffles, crêpes and cookies. 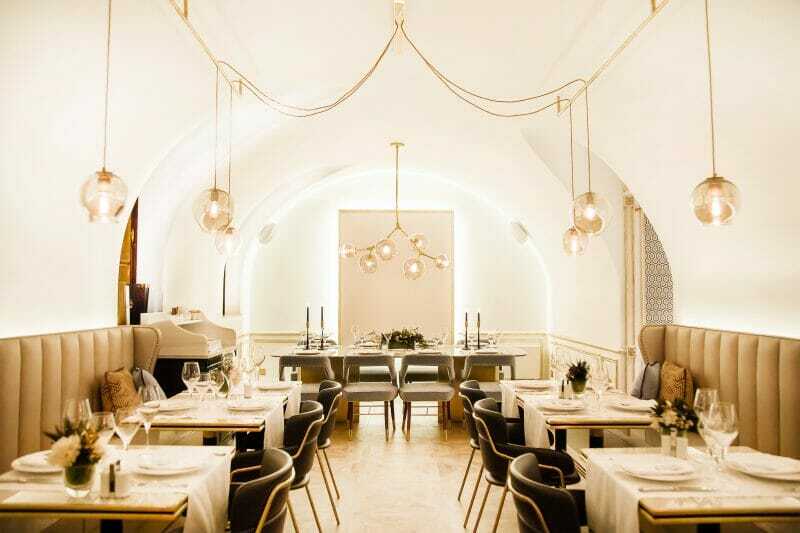 A quality novelty on the Preciados street, which along with its more than 75 cocktails and champagnes, will become one of the essential French restaurants in Madrid. Comedor del Café de París. Foto de Café de París. One of the French restaurants in Madrid with the shortest menu, in fact they have two dishes and a dessert. Its infallible formula is a green salad and an entrecôte with French fries (you can eat all you want). The secret lies in its butter, herbs and spices sauce. At the time of dessert there are more options to choose from, but the “crème brûlée al mascarpone con frutos rojos” is one of the most requested. Comedor de Caripén. Foto de Caripén. 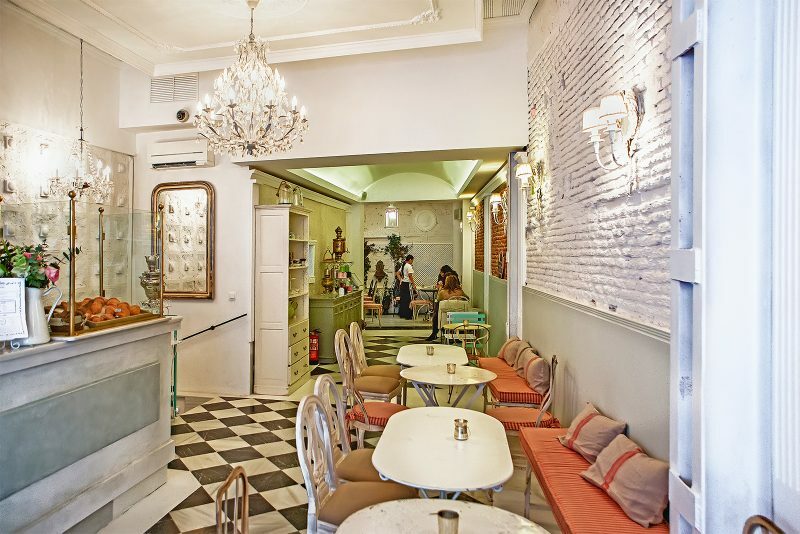 It occupies the place where the old flamenco tablao of Lola Flores was, and which is now one of the most intimate French restaurants in Madrid, with a clandestine touch. They only serve dinners, yes that’s right, until 3 in the morning. Two of its dishes are indispensable “foie mi- cuit” and “magret de pato” and nailed the “moules à la crème”. Just in front of the Senado, it’s likely that you coincide with actors and celebrities. One of the classics of the Madrid nightlife frequented by actors and celebrities. Interior de Creperie La Rue. Foto de Madrid Cool Blog. The most informal version of the crepes and wafers can be tried in this small place. 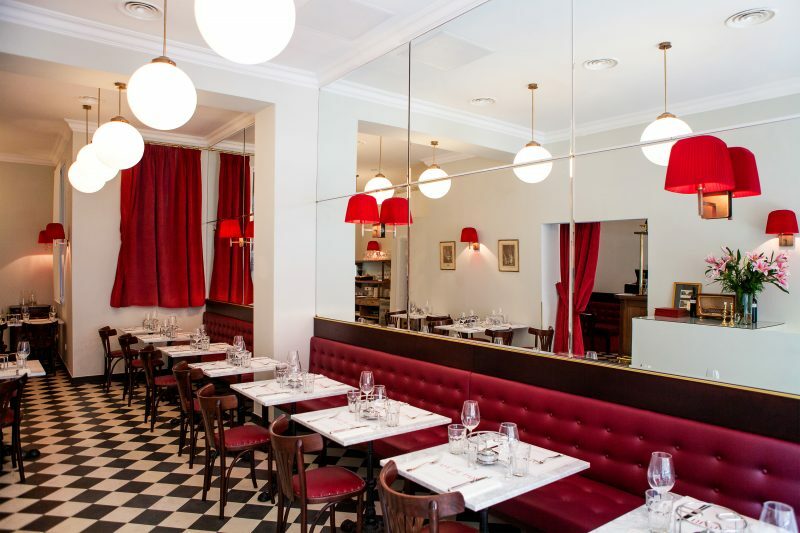 One of the most casual French restaurants in Madrid to dine lightly or share dishes with friends. And let’s not talk about improvised brunch J The place is cozy and precious, and all your food is made at the moment. Whenever I go, although they have a very extensive menu, I just order the “Nordic” galette (wafer) with salmon, cream cheese and Nordic sauce. And for dessert, as always, the Nutella, Banana and Cream, my downfall. Fachada de El Viejo León. Foto del Facebook de El Viejo León. 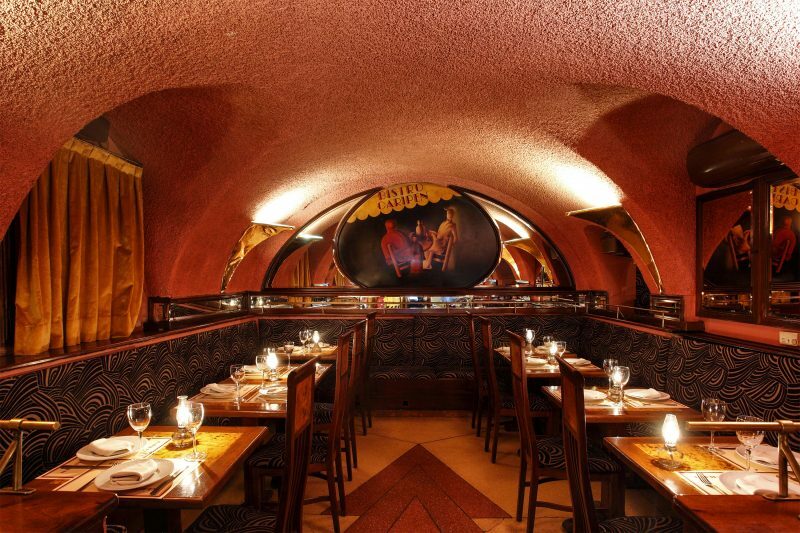 For more than forty years this place serves traditional French cuisine in a Parisian and somewhat kitsch atmosphere. It only has six tables, so booking in advance in absolutely essential. In fact I still have not been able to go, and I’ve already tried a couple of times. They have classics like the “Chateaubriand flambéed with whiskey and Porto sauce” and other typical dishes of the French Provence. 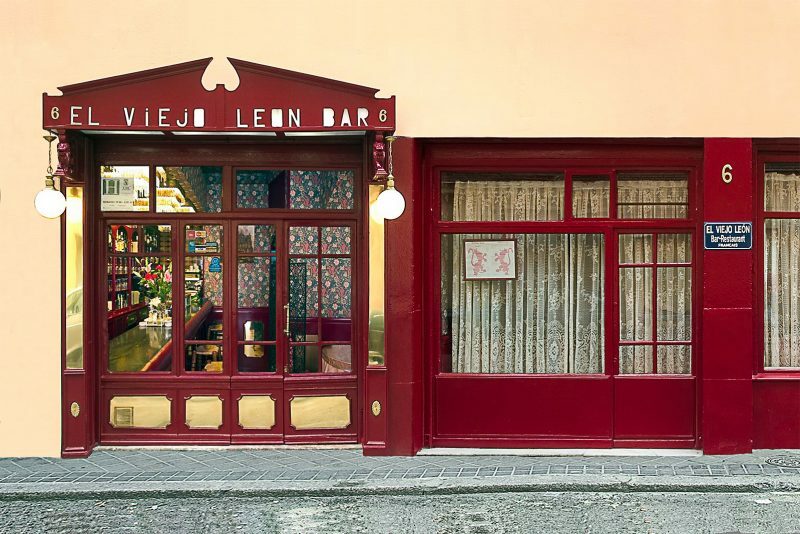 The oldest French restaurant in Madrid is a little secret of most gourmands, and a place that never seems to grow old. Salón des Fleurs. Foto de Madrid Cool Blog. 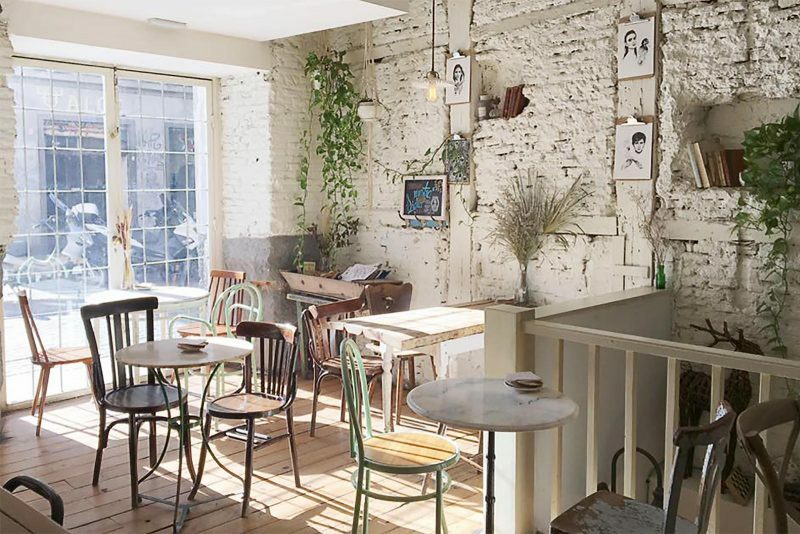 I know it doesn’t fit the definition of French restaurants in Madrid, but once you visit this café, you’ll fall in love with it. 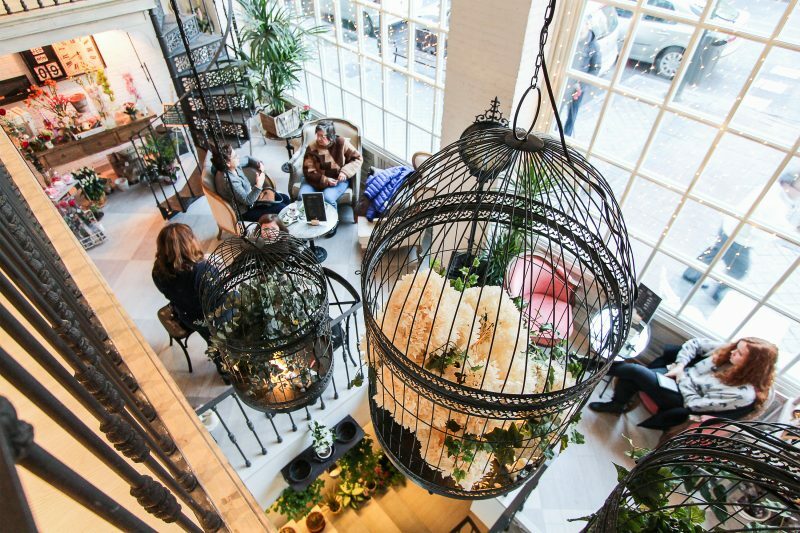 This beautiful place, full of vegetation, is a coffee shop and florist where you can enjoy the Parisian atmosphere. Its large windows and its seats make you want to spend all day there with a good book. But don’t forget to order an Apple Pie tea and a portion of two homemade chocolate cakes. Simply charming. Interior de Vailima. Foto de Vailima. There are few more romantic plans than a walk through El Retiro Park. But the walks always make you hungry J That’s why I recommend that you finish your visit to the pond or the Crystal Palace with a snack in this French tearoom. This sanctuary of French tea is the place where to confide your secrets while enjoying a portion of cheesecake. Listen up: in the very near future you will hear many things about French restaurants in Madrid. And I don’t mean only crepes and wafers: there is a vast range of little-known recipes waiting for you to discover. For my part I have no idea of how to speak French, but I’m going to learn the language of France, starting with their dishes 🙂 Do not miss any of my future discoveries! Translated by Story Of Madrid, the podcast about Madrid in English.